Incepted just three years after the beginning of the Kompakt venture in 2001, it's safe to say the Speicher series holds a very special place in both the heart of the label and its audience's. Taking the helm for the 102nd instalment in the catalogue (and the first Speicher to feature 3 tracks) we find an eclectic squad of producers triangulating from all corners of the globe but united by their boundless science of the groove. 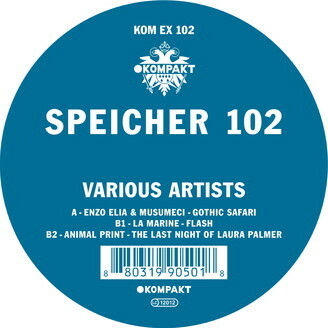 Longtime friends turned studio companions, Enzo Elia (of Balearic Gabba Soundsystem fame) and Musumeci join forces for the first time on the unfaltering late night hip-swayer 'Gothic Safari', kicking things off with a relentless deep dancefloor epic à la Âme. The vibe then swerves into further savannah-friendly audio territories with unheard French newcomer La Marine who, like his glorious predecessor Oxia (but is it fate?) operates out of the mountain-ringed city of Grenoble, here popping up with an off-axis downtempo electro hybrid of unknown provenance. Looping the loop with maximal tension and mind-piercing depth, rising Bolivian duo Animal Print serve up the aptly named Badalamenti-esque roller 'The Last Night Of Laura Palmer' - a track that won’t fail at recalling the ‘Twin Peaks’ aficionados the bizarro ambiences of Lynch's acclaimed TV show all the while following a rather straightforward, frontally club-ready sense of style, resulting in a fine balance between down-to-earth pragmatism and unbridled reverie.